It looks like Dragon Ball Heroes did what it promised. Over in Japan, popular series debuted its first episode as Bandai ordered a promotional anime for Dragon Ball Heroes. Now, fans around the world have checked the premiere out, and many were in for a treat. After all, a brand-new version of Son Goku was introduced, and he’s nothing like the hero fans grew up with. For those who’ve checked out Dragon Ball Heroes, you will know the Saiyan in question. After Goku and Vegeta arrive on the Prison Planet with Mai in tow, they are confronted by a man with powerful Ki. So, you can see why everyone was stunned when that man turned out to be Goku. Of course, this Saiyan wasn’t a clone of the Goku anime fans know already; No, this was Goku Xeno. The character made his debut way back in Dragon Ball Heroes’ first title, and this promotional anime brought the fighter to life. As you can see above, Goku Xeno dresses very differently from Goku. The man traded in an orange Gi for a tight black undershirt and loose pants. 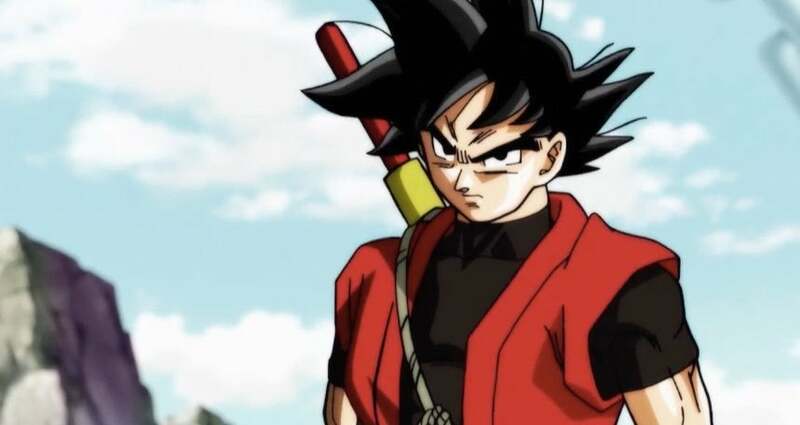 The black ensemble is topped with a long red robe tied with a blue sash, and Goku has his old power pole strapped to his back with a string. When Goku Xeno and Goku meet, their clashing personalities become apparently. While Goku is more childlike in speech, Goku Xeno sounds similar to Goku Black — you know, without all the evil intonations. Goku Xeno comes off more mature than his predecessor, and his aloof strategies liken him more to Vegeta than anyone else. So, it should come as no surprise that plenty of fans are loving this character’s big anime debut. How do you feel about this take on Son Goku? Let me know in the comments or hit me up on Twitter @MeganPetersCB to talk all things comics, k-pop, and anime!